What we love about the podcast is being able to bring you not only Murphy Brown but the history of Television it intersects! 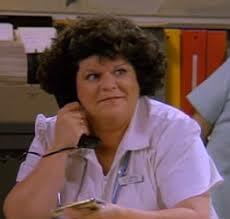 Mary Pat Gleason played Olga the Russian Secretary in Season 1, Episode 16 “Moscow On The Hudson” and you know her from so much more, like WIll & Grace (both versions), Gilmore Girls, & Friends! We also chat about her working with Whoopi Goldberg and the cult classic “Troop Beverly Hills”! You will love Mary Pat’s story, her resilience, finding her own voice as a writer and using it to share the struggles of mental illness. We know you’ll leave loving Mary Pat like we do!